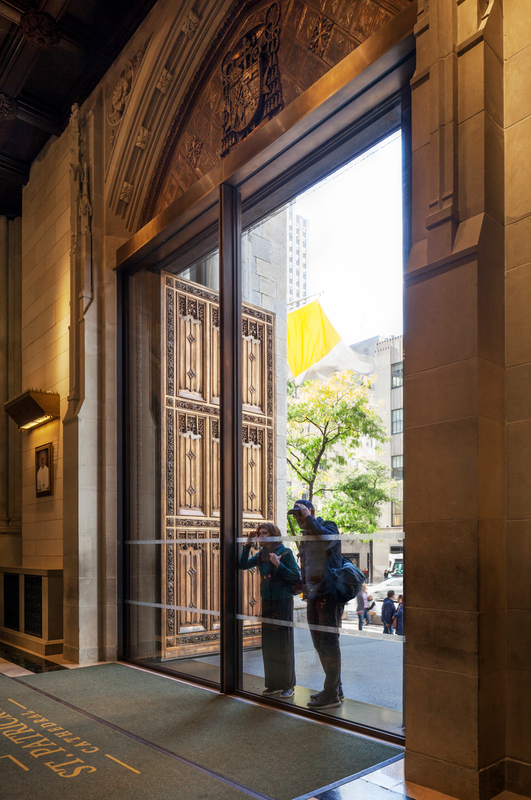 In addition to exacting preservation work, the renovation process led by Murphy Burnham & Buttrick Architects (MBB) incorporated minimalist architectural interventions, adding new sliding glass doors to the main Fifth Avenue entry and a structural glass enclosure to the intimate worship space known as the Lady Chapel. That enclosure, which Glass Magazine recently honored with an award for most innovative interior glass, was instrumental to achieving functional project objectives. This melding of old and new demonstrates how contemporary design and technology can help preserve historic buildings and spaces, enhancing their performance while accentuating their historic character. Any kind of modification to the existing fabric of iconic or historic can be challenging. In certain instances, a more traditional addition to the building may complicate its integrity, begging the question of whether that feature is part of the original fabric or not. The transparency of glass, on the other hand, can minimize the impact of interventions. 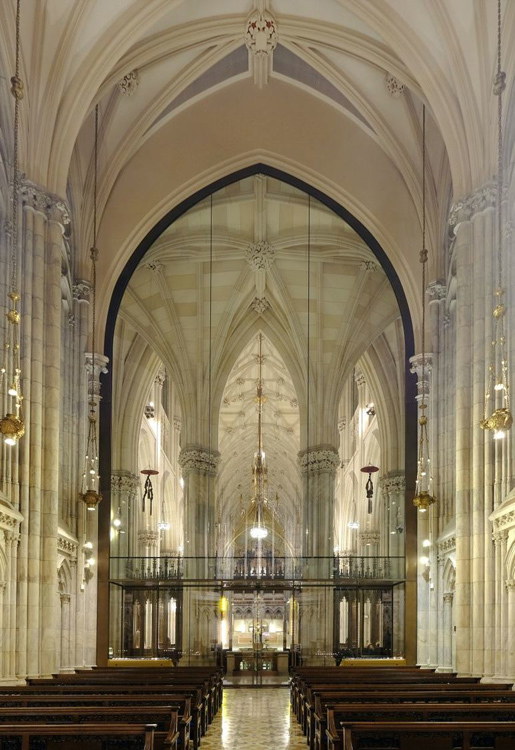 The leadership of the Archdiocese of New York also saw using glass in the St. Patrick’s Cathedral renovation as an opportunity to improve the building’s expression of the church’s core values—openness, welcoming, and a sense of sanctuary and refuge. 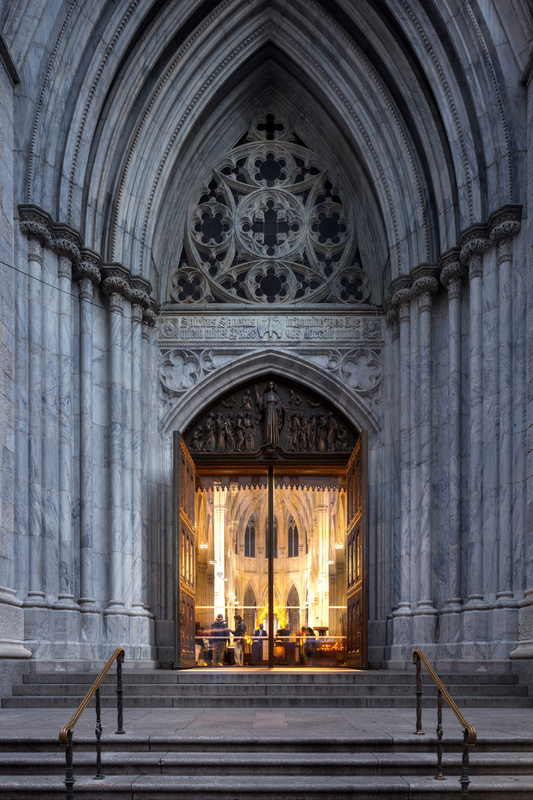 The cathedral entrance is symbolic of those values: throwing open the large bronze doors is a welcoming gesture, signifying to the millions of annual visitors and passers-by that the cathedral is open and available as a physical and spiritual resource. But keeping the doors open compromised energy efficiency. Since restoration work was already going to include significant upgrades to the cathedral’s mechanical plant, MBB suggested creating sliding glass pocket doors that could be hidden, but that would afford unencumbered views down the nave. This sustainable and sensitive solution allows the original doors to remain open while minimizing heat and air conditioning loss, working in concert with historic fabric to emphasize the original architecture. This is the essence of a modern intervention in an historic structure: the new works in service of the old, improving a user’s relationship to the original space by, in effect, disappearing entirely. The motorized glass pocket doors sit on a series of bearings that allow them to slide into the wall with the push of a button. Accommodating the doors necessitated bumping out the interior wall by four inches—and removing some of the stone entirely—to create enough space for the pocket as well as creating channels in the floor that could carry the weight of the glass doors. Already a significant undertaking, the glass insertions at St. Patrick’s Cathedral were made even more complex by the need to keep the cathedral open throughout the process. The project team conducted preparation work during the day by simply cordoning off the area around the entry doorframe. The installation work took place at night and into the early morning: working with Empire Glass, Structure Tone—the construction manager—orchestrated closing off a portion of Fifth Avenue so the glass assemblies could be delivered and put in place. Having a strong group of collaborators was key to the success of the renovation: the team included acclaimed engineer Robert Silman and glass structure designers Eckersley O'Callaghan Engineers. In addition to improving the cathedral entry, Archdiocese leaders sought to enhance the functionality of worship spaces within. 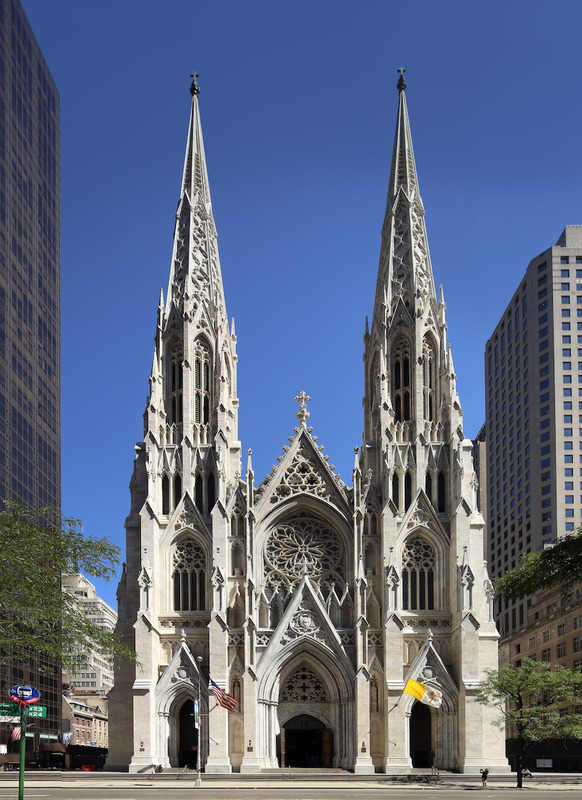 The popularity of St. Patrick’s Cathedral and the sheer number of daily visitors had acutely impacted the ability of the Lady Chapel to serve as a quiet, intimate space for worshipers. Responding to the needs of the public required enclosing this area to create acoustic separation while preserving the character of this space, which was designed to be quiet and intimate while still feeling contiguous with the rest of the cathedral. The project team was committed to finding a design approach that would complement the existing space. This project required a high level of technological and engineering sophistication. Working closely with the Archdiocese, the design team and glass wall fabricator Seele Inc. gradually pared down the design until support structures were as minimal as possible. Archdiocese representatives were convinced that glass was the solution after seeing a mockup of the structure at Seele’s workshop in Germany. Early design schemes featured steel beams and wood tracery that responded to the adjacent cathedral space. The design team challenged Seele to engineer a solution that would eliminate excess framing material while supporting three 1.5-inch-thick triple-ply laminated glass panels, each weighing up to 5,000 pounds. And MBB developed a minimalist sleeve that did not create any visual barrier around the Lady Chapel. A horizontal, 4 x 24–inch glass beam that spans 25 feet across is supported at either end by two 4-inch-square stainless steel tubes. The existing floor has very low structural bearing capacity, so those tubes transfer the load to new steel beams under the floor. The project team also had to build a new steel structure in the attic, where beams are turned on their sides to take on the lateral loads. Building this structure in such a limited space was incredibly complicated. Tolerances were tight, and the surrounding historic architecture was susceptible to damage. 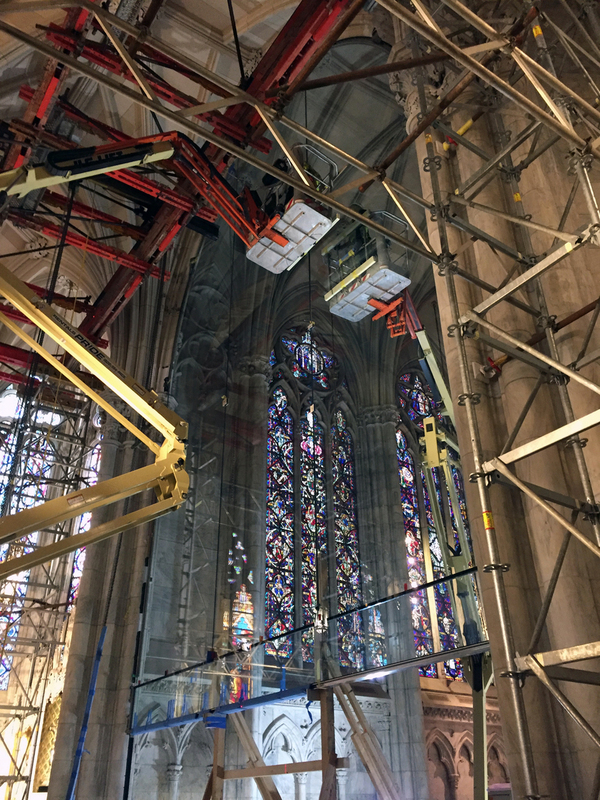 Installing the glass required a hydraulic gantry with large rubber suction cups to pick up the panels; because of the 48-foot-high arched ceiling, this gantry could only lift each panel to one inch above its installation height. In spite of this complexity, the whole assembly could be taken down if necessary, restoring the building to its original condition; that level of design functionality works in service of both historic fabric and contemporary need. 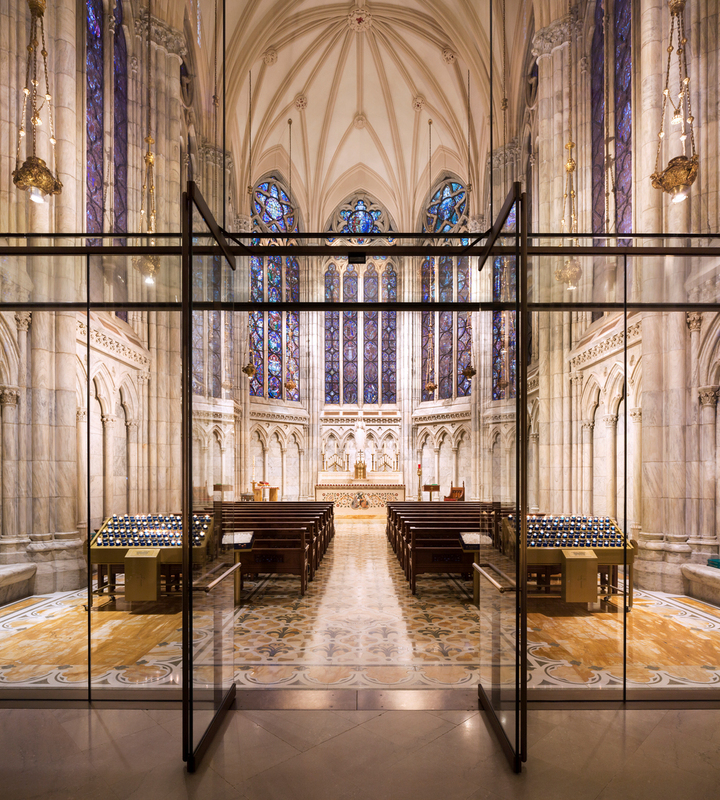 The glass work at St. Patrick’s Cathedral demonstrates that a minimalist approach is sometimes the most sensitive, contextual solution as well as the most effective for reaching functional performance goals. With smart choices and a strategic approach, architects and preservationists can turn preservation and renovation challenges into opportunities to improve functionality, increase community connections, and enhance historic fabric. As stewards of and designers for such historically significant buildings, we remain culturally sensitive by using technology and a light touch. Jeffrey Murphy, FAIA, is a leading practitioner in architecture, historic preservation, and adaptive reuse—and a partner at Murphy Burnham & Buttrick Architects. I must offer a dissenting view. While I will reserve final architectural judgment until I can see this project in person, I must say that the justification offered for it, that a traditional solution raises the question of what is historic and what is not, is superficial and over-emphasizes one important value at the expense of others. Making a distinction between historic fabric and contemporary intervention is not a matter of style. There is not only the danger that an installation like this avoid looking too much as if it had been intended as part of the original cathedral, but also the danger it may look too much like something that has no business being there. The attention paid to "differentiation" all too often ignores the equally important value of "compatibility" (to borrow the terms from Standard 9 of the Secretary of the Interior's Standards). In this case, an alien aesthetic ("minimalism" like we normally see in an Apple Store) has been imported into the heart of a great architectural landmark that is both a monument of the Gothic Revival and a center of religious devotion for millions of people. This doesn't seem to me to be an example that preservationists would want to encourage others to follow. The only positive quality I can see in the photographs is that the installation is apparently readily reversible.